Rule Review Ordered by Governor Rick Scott, Executive Order No. 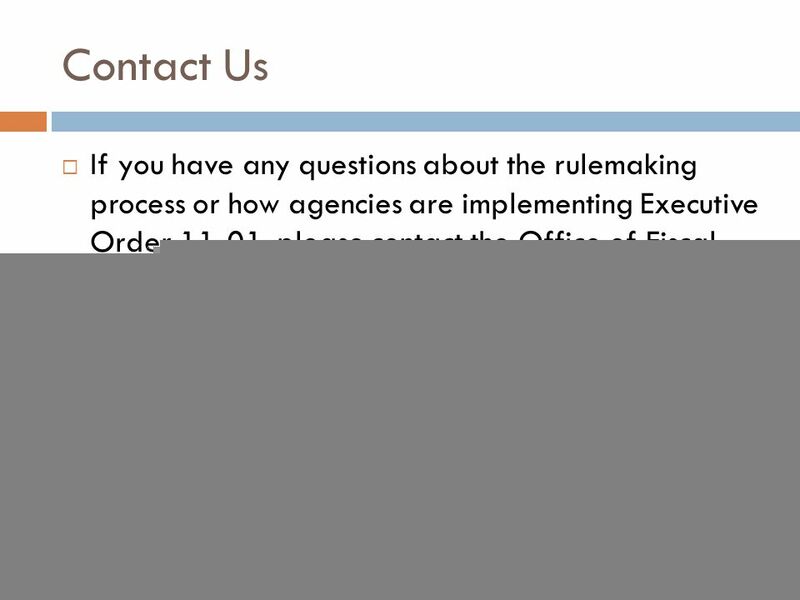 11-01 Prepared by the Office of Fiscal Accountability and Regulatory Reform to Assist the. 2 What Will this Tutorial Do for You? 1. 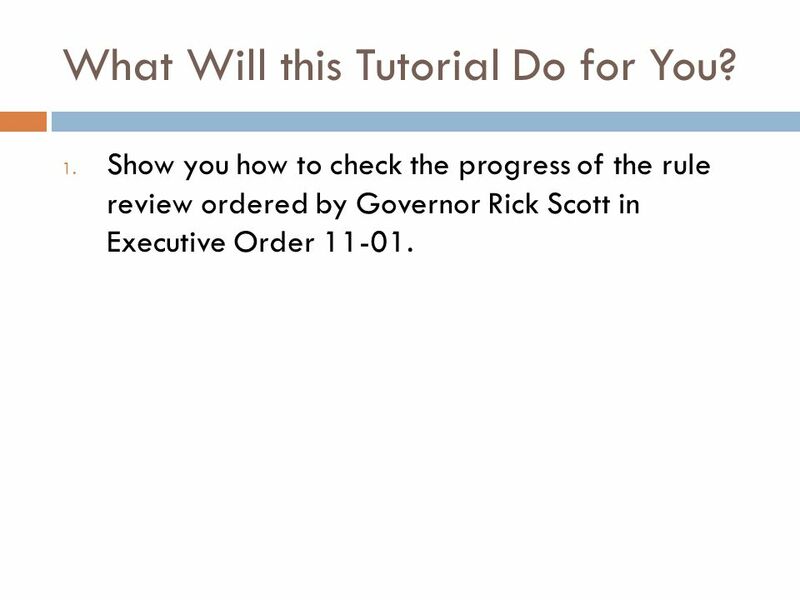 Show you how to check the progress of the rule review ordered by Governor Rick Scott in Executive Order 11-01. 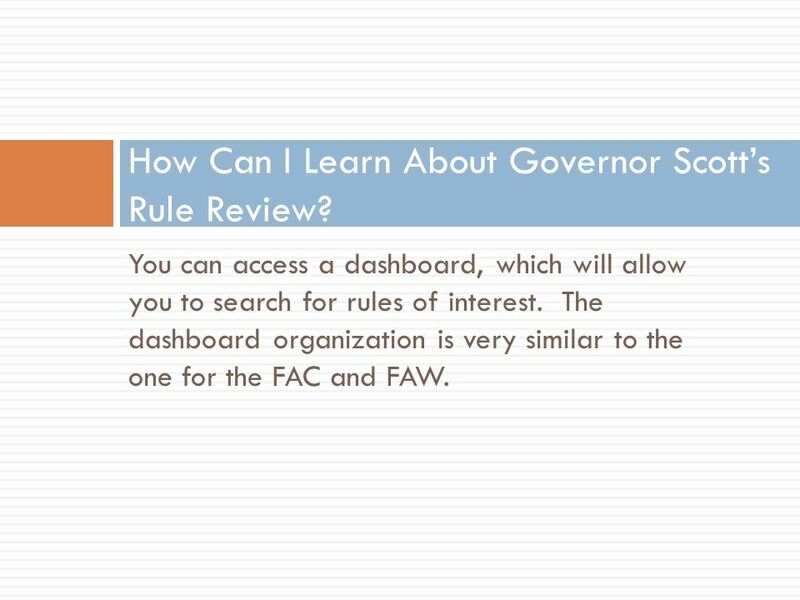 3 How Can I Learn About Governor Scotts Rule Review? You can access a dashboard, which will allow you to search for rules of interest. 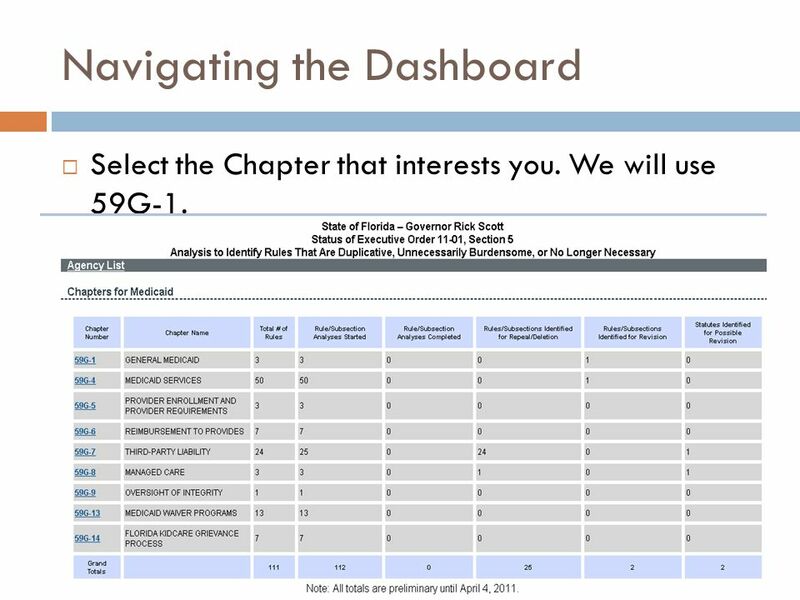 The dashboard organization is very similar to the one for the FAC and FAW. 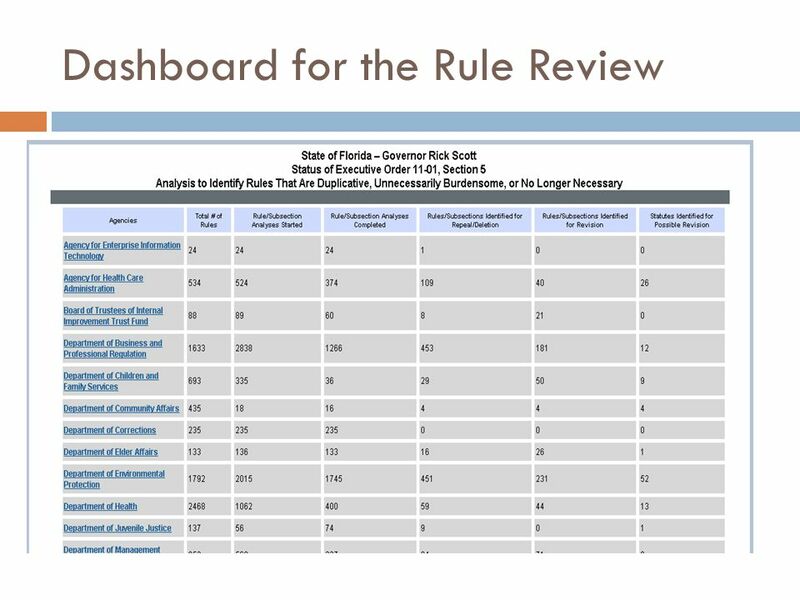 4 Dashboard The Dashboard lists only those rules covered by Executive Order 11-01. 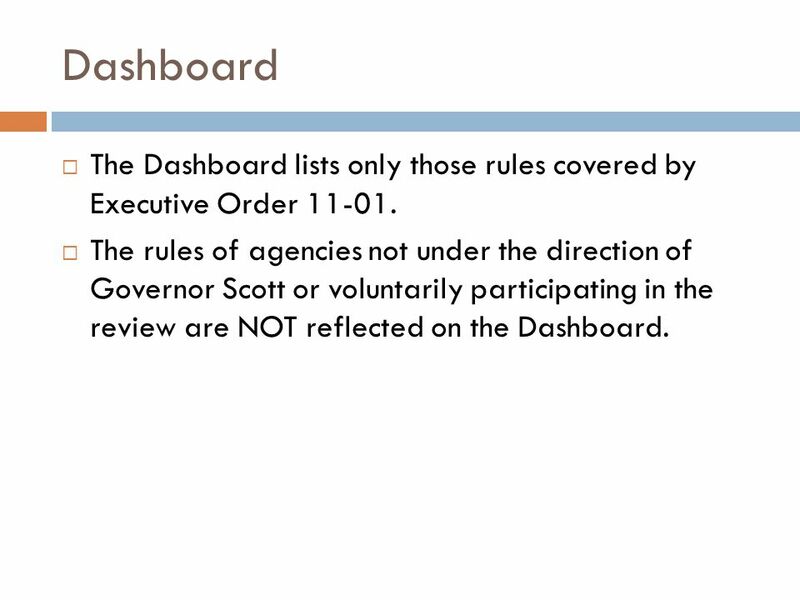 The rules of agencies not under the direction of Governor Scott or voluntarily participating in the review are NOT reflected on the Dashboard. 6 Navigating the Dashboard Click on the agency of interest. We will use AHCA. Then click on the Division or Board within the agency that interests you. We will use Medicaid. 7 Navigating the Dashboard Select the Chapter that interests you. We will use 59G-1. 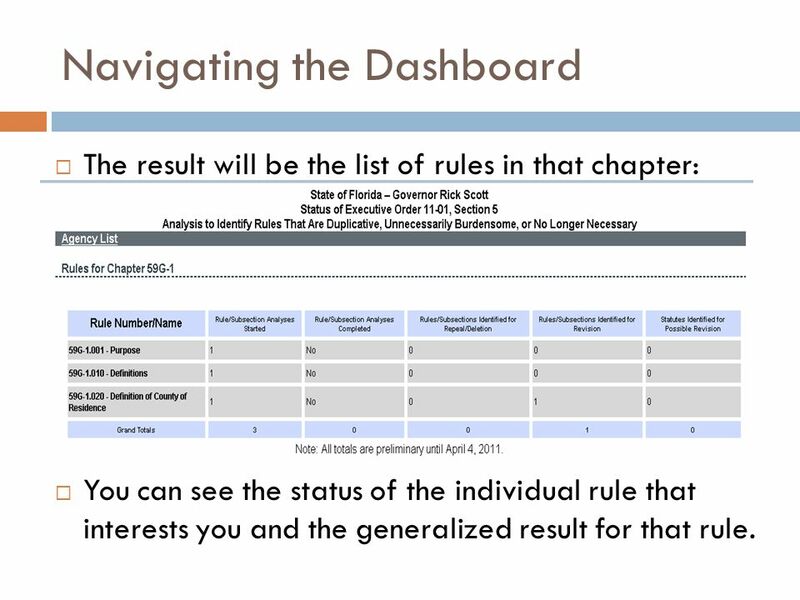 8 Navigating the Dashboard The result will be the list of rules in that chapter: You can see the status of the individual rule that interests you and the generalized result for that rule. 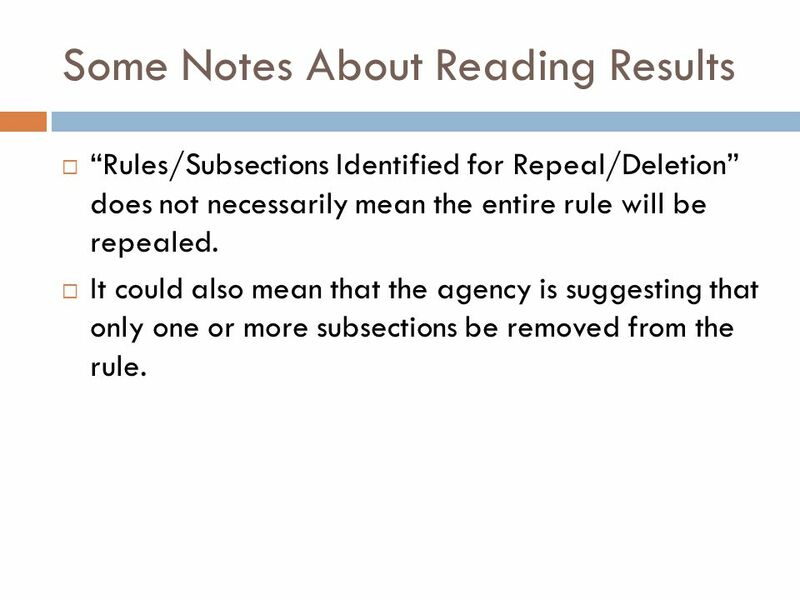 9 Some Notes About Reading Results Rules/Subsections Identified for Repeal/Deletion does not necessarily mean the entire rule will be repealed. It could also mean that the agency is suggesting that only one or more subsections be removed from the rule. 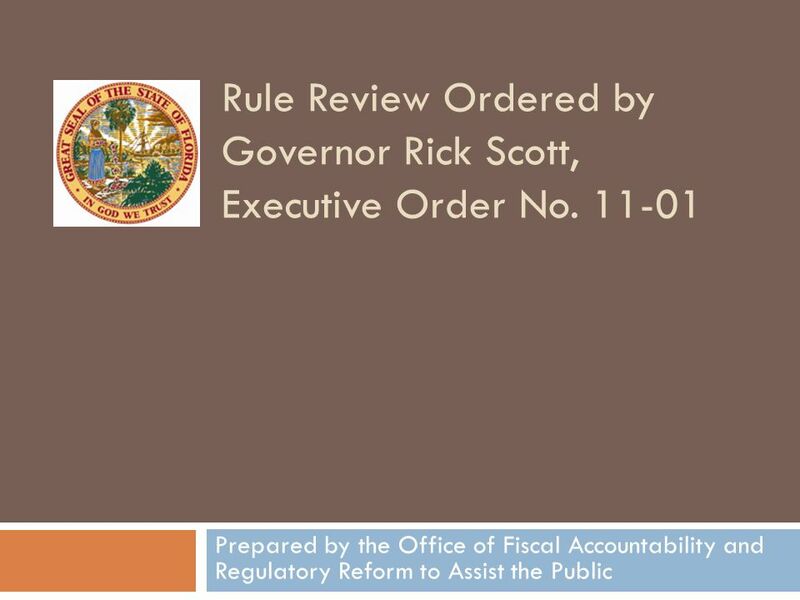 Download ppt "Rule Review Ordered by Governor Rick Scott, Executive Order No. 11-01 Prepared by the Office of Fiscal Accountability and Regulatory Reform to Assist the." My AmeriCorps Release 3 State Commissions and Programs User Roles and Management – Implementing Presentation developed for the Corporation for National. The DMS Website ~ SLERS Notify Me & Notification Settings EZ PUBLISH GUIDE. My AmeriCorps Release 3 AmeriCorps National Programs User Roles and Management – Implementing Presentation developed for the Corporation for National and. James W. Stuckert Career Center Location: 408 Rose Street, University of Kentucky Office Hours: Monday-Friday, 8:00 a.m.- 5:00 p.m. Drop-In Hours: Tues-Thurs. FRATERNITY AND SORORITY LIFE COMMUNITY SERVICE/PHILANTHROPY Campus Link Tutorial Revised 1/14/13. Agency for Health Care Administration Health Care Clinic Licensure Unit Health Quality Assurance Gov. Rick Scott Liz Dudek Gov. Rick Scott Liz DudekSecretary. 1 Account Payable Information  Introduction to iSupplier  Vendor Registration  Orders Tab  Shipments Tab  Account Tab View invoices View payments. 1 What is iSupplier? Why should my company register?  iSupplier is for those vendors who wish to directly access information regarding transactions with. Setting up Wordpress Directions Creating an account Lost your password? Finding your dashboard Changing the background theme Adding the Images page Making. Statewide Medicaid Managed Care Update Beth Kidder Assistant Deputy Secretary for Medicaid Operations Presented to the Florida Commission for the Transportation. 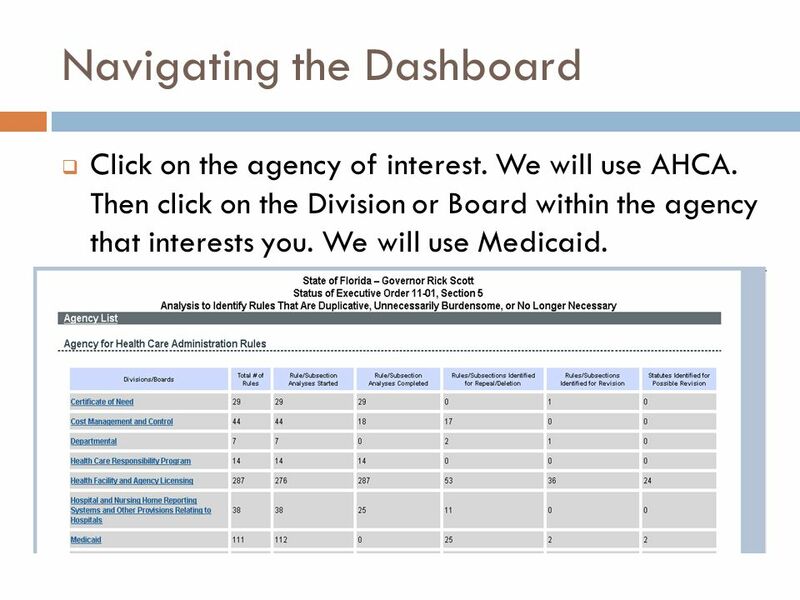 Learning Objectives Share basic Florida Medicaid compliance tips with Florida Medicaid providers Improve compliance with Florida Medicaid policy Refresh. Electronic Research Administration The National Institutes of Health, Office of Extramural Research Financial Conflict of Interest (FCOI) Notification. Welcome to Office of the State Register Agency Training  This tutorial is designed to acquaint you with the publications. Welcome to Online Registration The Learning Center.